From Ad Astra, Volume 23 Number 3, Fall 2011 Artwork by Dennis Davidson courtesy NASA, from Space Resources, NASA SP-509, 1992. As we mark the 50th anniversary of John F. Kennedy’s historic challenge to the nation “to send a man to the Moon and return him safely to the Earth,” a small group of people recently got together to ponder the question: “What is keeping us from going back?” They concluded that there is nothing technical that stands in our way; in fact, the drive to go back to the Moon has already begun. Most people don’t realize this, because it is being done in a different way — through the private sector and through public/private partnerships. While NASA is supporting it, they are not leading it. Realizing this, the group decided that the new goal should be to build the first permanent human settlement on the Moon, with the nations of Earth, for the benefit of humanity . 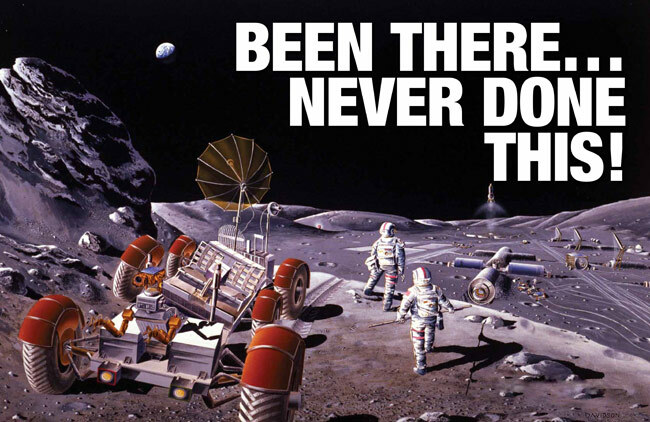 . . and do it in time for the 50th Anniversary of the last man to leave the Moon (2022). In November 2010, the Japan U.S. Science, Technology, and Space Applications Program (JUSTSAP) held its annual symposium in Hawaii on the Big Island. The conference focused on developing a plan to build sustainable robotic and human settlements beyond low Earth orbit, especially in ways that could enable a permanent human presence in space. In particular, the conference emphasized evaluating both the benefits and potential approaches to establishing a multinational research park on the Moon, developed and operated by a consortium of spacefaring nations from around the world. The symposium delegates included leading scientists, engineers, educators, business leaders, and government officials from NASA, JAXA, private industries, and universities in both Japan and the United States. During four days of deliberation, they formulated a vision for an International Lunar Research Park that would align common space exploration goals with complementary resources and capabilities among nations worldwide to substantially reduce the costs, enhance the benefits, and accelerate the timetables for future space missions. Going back to the Moon is a matter of harnessing existing technologies in innovative ways; breakthrough technology isn’t necessary. This effort can be divided into three phases. The first phase uses terrestrial analogs like the one on the Big Island of Hawaii to demonstrate and validate the required technologies and concepts. The second phase leverages the investments from the Google Lunar X PRIZE teams and the capabilities of the traditional and emerging commercial space companies to go back to the Moon robotically, eventually setting up a “robotic village.” These robots would prepare the site and develop the infrastructure to enable the third phase — a permanent human presence on the Moon. The first phase of the proposed ILRP would begin with the development of a terrestrial prototype for a multinational lunar base, established in Hawaii through the Pacific International Space Center for Exploration Systems (PISCES) at the University of Hawaii at Hilo. The PISCES analog site would utilize the unique terrain on the Big Island (which closely simulates the lunar soil, or regolith) to test and evaluate innovative robotics, energy, communications, resource utilization, and other technologies required to establish and sustain long-term settlements in space. It also would serve as a unique international center for space research and education to inspire and train the next generation of scientists, engineers, and entrepreneurs that will develop the space frontier. NASA and the State of Hawaii have already sponsored two international robotic lunar simulation expeditions on Mauna Kea, the first in 2008 and the second in 2010. These expeditions were designed to try out in-situ resource utilization (ISRU) technology to robotically extract water, oxygen, and other valuable elements from the lunar soil. Multiple NASA centers and universities were involved in these expeditions, as well as the Canadian Space Agency (CSA) and the German Space Agency (DLR). Phase 2 of the ILRP would focus on implementing a robotic village on the lunar surface — building upon unmanned missions currently under development by Google Lunar X PRIZE contestants and other entrepreneurial ventures, as well as at NASA and other space agencies. There are currently 29 teams registered for the $30 million Google Lunar X PRIZE competition. The first team attempt to win the prize could come as early as 2014. In addition to the Google Prize, NASA held a competition last year and awarded Innovative Lunar Demonstration Data (ILDD) contracts to six U.S. competitors worth up to a total of $30.1 million. The purpose of the contracts was to have them share data with NASA on how they are engineering their attempts to go to the Moon. Many of these teams are planning on continuing to travel to the Moon after the Google Lunar X PRIZE is won. The Robotic Village concept could help answer the question: What happens after someone wins the Google Lunar X PRIZE? Lunar power and communications infrastructure would need to be put in place to enable 24/7 functionality of the lunar robots and provide the power to survive the two-week long lunar night. One possible solution to the power problem is beaming energy from lunar orbit to the lunar surface (see 2009 Ad Astra article on lunar power beaming). By using an infrared power laser with a companion communications laser, both power and communications could be accommodated from a single source satellite. If commercial and/or government robotic entities are operating on the lunar surface in the 2014-2015 timeframe, then by 2018 the lunar robotic village could begin to be assembled. Initial activity would include selection of the site for the village and development of power, data, and communications infrastructure, as well as robot shelters or thermal wadis. Robots in the village would be teleoperated from Earth and would provide a unique capability for scientists, entrepreneurs, educators, and students to explore the lunar surface and conduct groundbreaking experiments. These robotic technologies would evolve over time to eventually enable the construction of the first habitable human settlement on the Moon. Phase 3 would include full construction and delivery of human habitats and the infrastructure required for a permanent return of humans to the lunar surface. This lunar facility can be used as a platform for atmosphere-free observations of our Earth, Sun, and other planets within our solar system. These modules would also facilitate mining of the lunar regolith to spur space commerce, an outpost for media to enhance public awareness of the benefits of space exploration, and a destination for space tourism. Finally, they will provide a staging ground for both robotic and human missions to asteroids, Mars, and other “deep space” destinations, as well as a testbed for advanced technologies that eventually would enable pioneering voyages throughout the solar system. 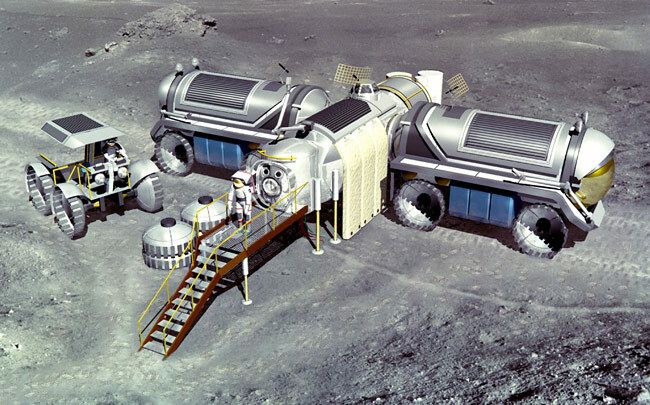 In parallel with the lunar surface infrastructure, a modular reusable lunar transportation system would be established. This system would start off from LEO (low earth orbit) and consist of a reusable lunar cycler that would transit from LEO to LLO (low lunar orbit) and back again. This vehicle would transport the people and cargo bound for the lunar base. Upon return, the vehicle would use the Earth’s atmosphere to slow down in a process called aerobraking, to reduce the amount of propellant required for the trip. The vehicle would be refueled in space at a propellant depot and wait for the next flight of payload and passengers to arrive from Earth. A reusable lunar lander would also be developed. Payload and passengers from the lunar cycler would be transferred to the lander and this vehicle would then descend from LLO to the lunar surface adjacent to the lunar base. The lander vehicle would be unloaded, serviced, and refueled with propellant derived from the lunar resources ready for the next flight. This extraordinary concept and strategy was scrutinized by a group of high-level experts who assembled at NASA Ames on April 5, 2011. They came from a variety of fields, led by the Office of Aerospace Development of the State of Hawaii. The event featured a keynote address by self-made billionaire Henk Rogers, best known for revolutionizing the video game industry by bringing Tetris to the United States. Participants included venture capitalists such as Steve Jurvetson, whose Draper Fisher Jurvetson network manages a $7 billion portfolio representing investments on four continents, and Nobel Laureate Baruch Blumberg, who identified the Hepatitis B virus, and later discovered its vaccine. John Spencer, the president of the Space Tourism Society, weighed in with concepts receiving significant and serious interest from high stakes investors. Technical experts from NASA, the NASA Lunar Sciences Institute, and the Lunar and Planetary Institute, JPL, Boeing, and participants in the Google Lunar X PRIZE were also present. The group developed a feasible plan and presented it on the ILRP website. The International Space Station, which weighs almost a million pounds, and is as big as a 20 story building, is the existing proof that a permanent human facility can be built by a multinational team on the Moon. All of the major systems needed for the ILRP are either already available or are at a prototype stage, or could be prototyped using existing technologies. Existing commercial launch vehicles, such as SpaceX’s Falcon 9 and ULA’s Delta IV Heavy are adequate for building the second phase of the ILRP, the robotic village. Phase 3 would require vehicles such as the Falcon Heavy, lunar cycler, and the reusable lunar lander as well as propellant depots both in Earth orbit and on the lunar surface. Prototypes of inflatable habitats, commercially developed by Bigelow Aerospace, are flying in low Earth orbit. Bigelow is planning on having an operational space facility in LEO by 2015 and has stated that he could have a habitat on the Moon early in the next decade. 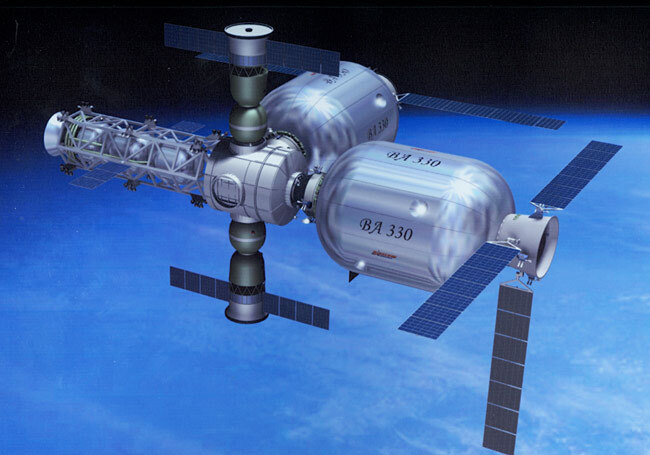 An artist’s conception shows a Bigelow Aerospace complex in Earth orbit. Such a station could serve as the precursor for prefabricated lunar bases after 2020. Courtesy Bigelow Aerospace. Why would anyone fund this endeavor? Most prior plans for permanent human settlement focused on supporting NASA’s exploration goals and space science. However, ILRP proponents took a page from terrestrial research parks and land use deals. The ILRP group recommended that the base be a mixed-use facility. Bruce Pittman is president of the Silicon Valley Space Club and chairman of the AIAA Commercial Space Group. The opinions expressed are solely those of Mr. Pittman.